Michael Specter's recent articles bashing Vandana Shiva and the labeling of genetically engineered foods (Seeds of Doubt and The Problem with G.M.O. Labels, 8/25/14) in the New Yorker are the latest high-profile pro-GMO articles that fail to engage with the fundamental critique of genetically engineered food crops in US soil today: rather than reduce pesticide inputs GMOs are causing them to skyrocket in amount and toxicity. Setting the record straight, Dr. Ramon J. Seidler, Ph.D., former Senior Scientist, Environmental Protection Agency, has recently published a well-researched article documenting the devastating facts, "Pesticide Use on Genetically Engineered Crops," in Environmental Working Group's online AgMag. Dr. Seidler's article cites and links recent scientific literature and media reports, and should be required reading for all journalists covering GMOs, as well as for citizens generally to understand why their right to know if food is genetically engineered is so important. The short discussion below summarizes the major points of his five-page article. 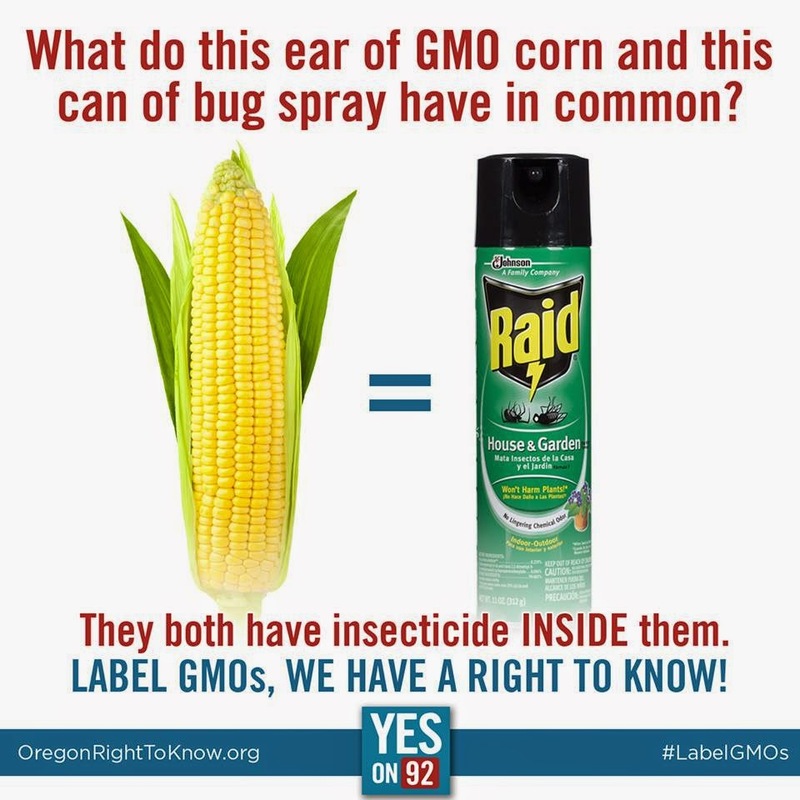 Over 99% of GMO acreage is engineered by chemical companies to tolerate heavy herbicide (glyphosate) use and/or produce insecticide (Bt) in every cell of every plant over the entire growing season. The result is massive selection pressure that has rapidly created pest resistance--the opposite of integrated pest management where judicious use of chemical controls is applied only as necessary. Predictably, just like overuse of antibiotics in confined factory farms has created resistant "supergerms" leading to animals being overdosed with ever more powerful antibiotics, we now have huge swaths of the country infested with "superweeds" and "superbugs" resistant to glyphosate and Bt, meaning more volume of more toxic pesticides are being applied. For example, the use of systemic insecticides, which coat GMO corn and soy seeds and are incorporated and expressed inside the entire plant, has skyrocketed in the last ten years. 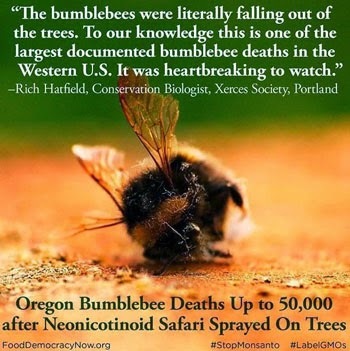 This includes use of neonicotinoids (neonics) which are extremely powerful neurotoxins that contaminate our food and water and destroy non-target pollinators and wildlife such as bees, butterflies and birds. In fact, two neonics in widespread use in the U.S. are currently banned in the EU because of their suspected link to Colony Collapse Disorder in bees. 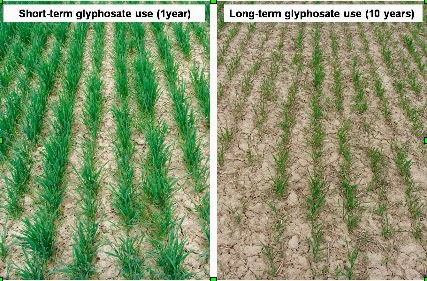 Mainstream pro-GMO media also fail to discuss the ever-increasing amount of older much more toxic herbicides like 2,4 D and Dicamba being sprayed along with huge volumes of Glyphosate to deal with superweeds. 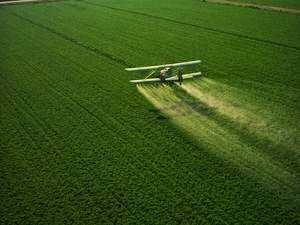 Most importantly and egregiously, this biased reporting does not mention the imminent approval of the pesticide industry's next generation herbicide-tolerant crops that are resistant not only to glyphosate, but also high doses of 2,4 D and Dicamba, that will lead to huge increases of these toxic chemicals sprayed on our food and farming communities. USDA and EPA are in the process of rubber-stamping these into our farming communities (and unlabeled onto our dinner plates) this fall, yet pro-GMO media consistently fail to discuss their imminent approval even as the lower-toxicity profile of Glyphosate is touted. Such reporting gives a pass to the chemical pesticide industry that pours millions into lobbying government and media elites and defeating voter ballot initiatives to require labeling of GMO foods. Hopefully Dr. Seidler's article will be widely read and disseminated, so reporters can learn the facts and check their biases against industry-fed distortions. Citizens and consumers need to hear the fundamental concern that GMOs are doubling down on, not freeing us from, the pesticide treadmill that contaminates our food and water while lining the pockets of the chemical companies that make both the GMOs and the pesticides used on them. David Bronner is President of Dr. Bronner's Magic Soaps, the top-selling brand of natural soaps in North America. He graduated with a degree in Biology from Harvard University in 1995. A leader in the fight to label GMO foods in the U.S., David dedicates resources to different issues on behalf of the company's mission to make products of the highest quality, and to use profits thereof to help make a better world.